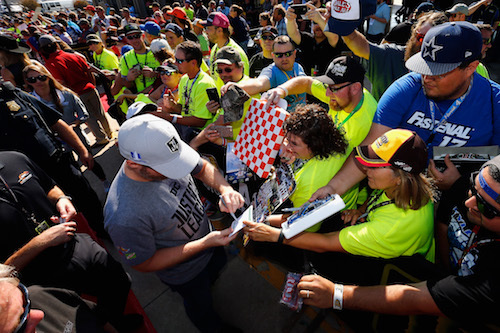 Dale Earnhardt Jr. maybe retired as a Monster Energy NASCAR Cup Series driver, but he’ll lead the field to the green flag for the Big Machine Vodka 400 at the Brickyard on Sept. 9 at Indianapolis Motor Speedway. On Wednesday, IMS announced Earnhardt as the pace car driver for the 2018 edition of the NASCAR Cup Series race at the storied track. Earnhardt, who retired from full-time NASCAR competition as a driver at the end of last season, made 17 starts in the Brickyard 400, resulting in five top-10s and a best finish of fourth in 2012. Since his retirement, Earnhardt has transitioned into a NASCAR TV analyst for NBC Sports. After two-consecutive NASCAR Busch (now-Xfinity) Series championships in 1998 and 1999, Earnhardt’s Cup Series career began with part-time status in 1999, and he went full-time in the series in 2000. The 15-time Most Popular Driver won 26 times in 631-career Cup Series starts. His career-stats also include149 top-fives and 260 top-10 finishes driving for Dale Earnhardt Inc. and Hendrick Motorsports.